This time of year peaches are bountiful. They are delicious grilled, in salads or by themselves but my favorite has got to be peach crisp! 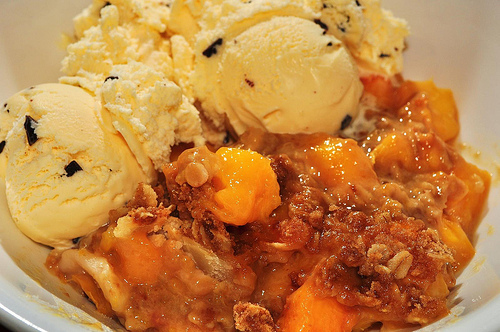 In a bowl, combine all ingredients except the peaches and mix until crumbly. In a 8 in microwave safe dish arrange sliced peaches along the bottom. Sprinkle bisquick mixture over the top and microwave 4 minutes. Turn the dish and microwave anothe r6 minutes or until peaches are fork tender. Serve with ice cream!